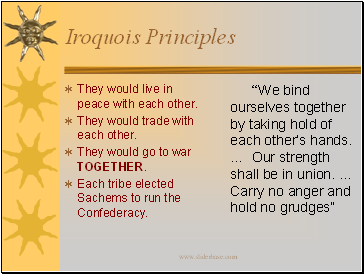 The Forming of the Iroquois. 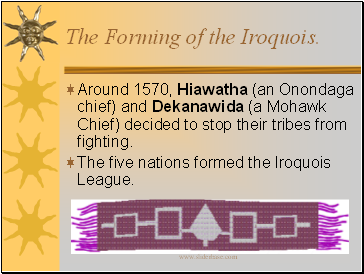 Around 1570, Hiawatha (an Onondaga chief) and Dekanawida (a Mohawk Chief) decided to stop their tribes from fighting. 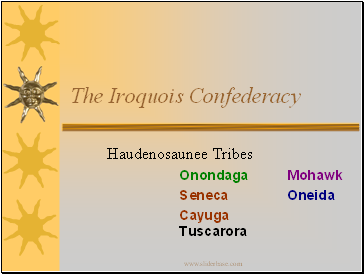 The five nations formed the Iroquois League. They would live in peace with each other. They would trade with each other. They would go to war TOGETHER. Each tribe elected Sachems to run the Confederacy. 100 foot long houses that held 10-20 families. Each family had a section of the house. 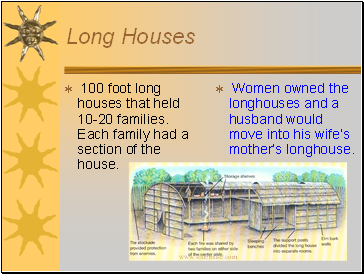 Women owned the longhouses and a husband would move into his wife’s mother’s longhouse. 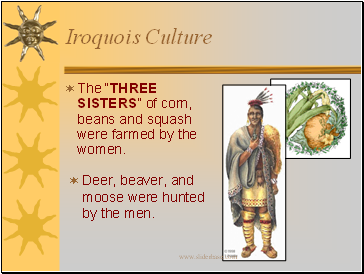 The “THREE SISTERS” of corn, beans and squash were farmed by the women. Deer, beaver, and moose were hunted by the men. No grazing land for herds. 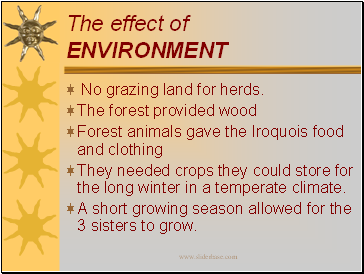 They needed crops they could store for the long winter in a temperate climate. A short growing season allowed for the 3 sisters to grow.